Today, Vian has been exhumed and pronounced Literary. (Capital C for French publishers currently living off the corpse d'esprit.) His works are being dredged up and recycled at an amazing rate - sixty-eight titles, and still counting. They include obscure essays, juvenilia, and collections of unedited manuscripts. We're talking about a writer who, when his ticker still beat a weak tattoo in his over-six-foot-body, pointedly was snubbed by critics and compromised by publishers. Vian's literary predecessors were formidable. Stéphane Mallarmé had revolutionized poetry with original language and syntax, and Proust had written the precursor to the interior modern novel. Sartre was astounding audiences with his avant-garde existential plays, later transformed into the Theater of the Absurd by playwrights Ionesco and Beckett. Vian's play The Empire Builders (Les Batisseurs d'empire; ou, le schmürz) which he never saw performed, now often is included in Theater of the Absurd anthologies. In any case, many of these elements remarkably coalesced in Vian's writing with few traces of derivation. By the time he drafted his early stories in 1945-46, he had assimilated some of Proust's narrative technique, Mallarmé's wordplay, Sartre's existential perspectives, and in the process, created a voice of his own. The short story form came naturally for Vian, and he published these and other stories in journals and tabloids. In the preface to Le Ratichon baigneur, a posthumous collection of miscellaneous stories, editor Noël Arnaud writes: "Boris Vian no doubt conceived of the story as short, fast-paced, never stuck, turning on hubcaps, stopping dead at the finish line - and assuredly, he wrote it that way." I first was introduced to Boris Vian while living in Tellaro, a small fishing village on the Ligurian coast of Italy. Marie Geneviéve, a French friend from student days, arrived for a visit and brought Vian's poems and the story collection Les Fourmis. She was a songwriter, worked as a script girl in the Paris cinema and naturally was attracted to Vian's versatility. For hours we sat on the rocks below Villa Isoela overlooking the Mediterranean and took turns reading Vian out loud. I was hooked. But it wasn't until several years later, while I was employed as a musician in Brazil, that I started to translate these stories. This is the only collection of Vian's short fiction published during his lifetime (by Editions du Scorpions in 1949) It was reissued by Le Terrain Vague under the original title in 1966. Oddly, three stories collected as Les Lourettes Fourées are appended to Vian's novel L'Herbe rouge, published posthumously in 1962 by Jacques Pauvert. In addition, two other collections have appeared: Le Loup Garou and Le Ratichon Baigneur. In all, a total of forty-two stories are in print in France. 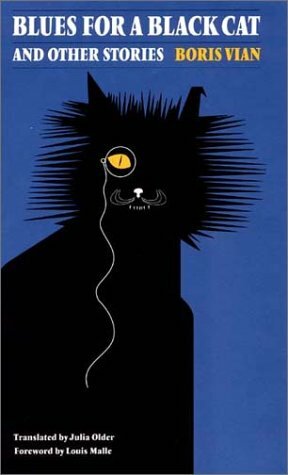 Blues for a Black Cat and Other Stories provides a perfect introduction to Vian for readers of English. These stories contain the pivotal characters and absurdist qualities germinal to his later novels and plays. Some of the stories, such as the title tale, pave the way for Vian's blacker humor, which surfaces in "Voyage to Khonostrov" and "Dead Fish." Though boldly defiant, Vian always disguises social protest in vertiginous flights of fancy, quirky sexual encounters, and doomed romantic affairs. But his unique parody tends to heighten the masked terrors of war, poverty, ill health, and unemployment that hound the bizarre protagonists of these fable like narratives. Julia Older - University of Nebraska Press has a web site where this book is available in both hard and soft cover editions. The excerpt from Julia Older's introduction is used by permission of the author. Julia is working on another Vian project - an English edition of his Collected Poems. She has already published quite a few in translation in literary reviews (Appalachee Quarterly, New Directions, Exquisite Corpse).